As we all lead increasingly busy lives, it’s more important than ever to take a bit of time out to pamper yourself. Do you have a favourite salon? 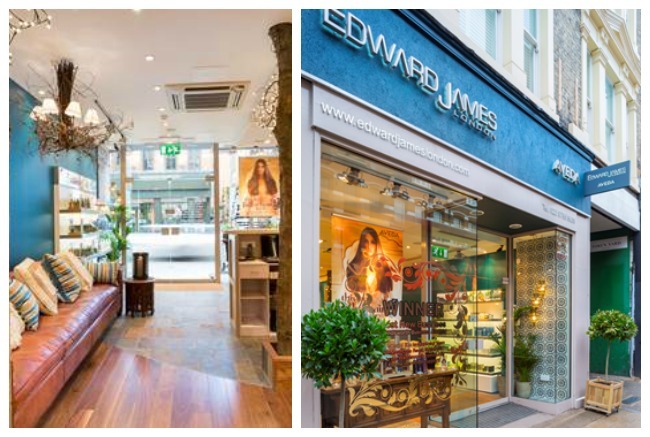 Have you ever been to one of Edward James London’s locations in Clapham or Putney? 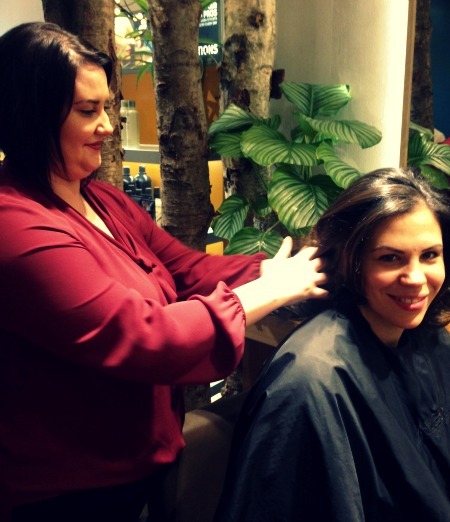 It may turn out that Edward James London becomes your favourite salon after your first visit or at least one of your top three hair and beauty hangouts. 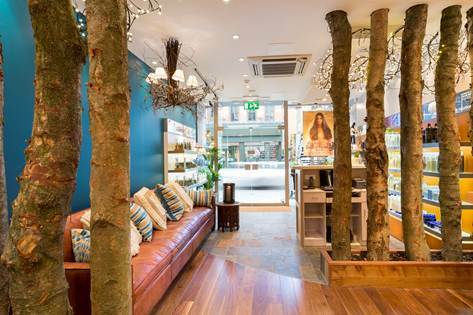 I visited the Putney salon, which is an oasis of calm and relaxation from the moment you walk in. 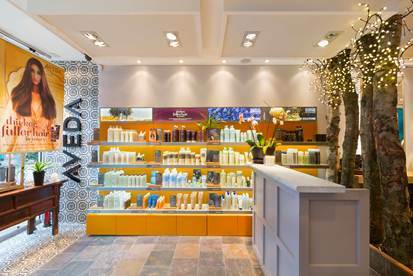 As I closed the door and breathed in the fresh scents from Aveda candles and Aveda shampoo, my tense shoulders dropped and the noise and the stress from the busy London streets felt like a world away. And that was just the start as further relaxation came from the stacks of up-to-date magazines and a glass of bubbly as I had the consultation. 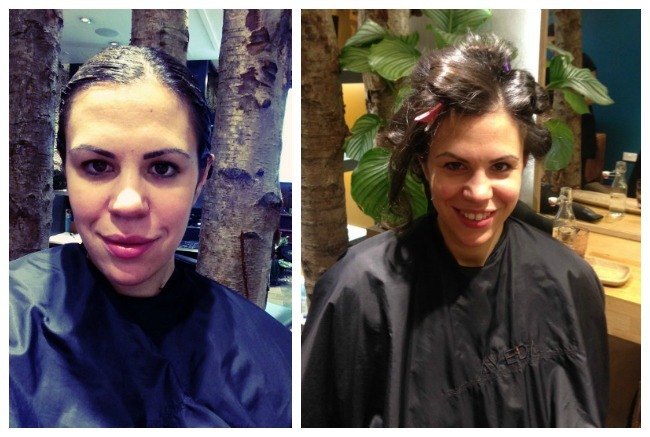 I was there to try the Top Coat treatment, which promises up to six weeks of shiny hair. The treatment adds protein bonds to the hair initially followed by lots of natural oil and more proteins. It is 99% naturally derived so you get the shine without the harsh artificial chemicals. I was delighted with the results, which are quite dramatic from this ‘Before and After’ picture. 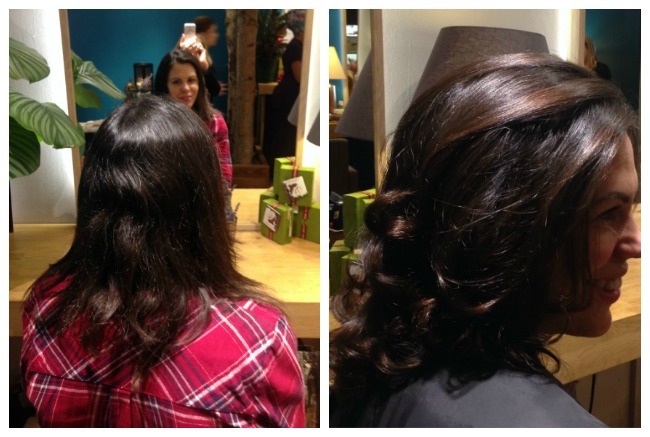 It took 90 mins in total for the treatment to be left on the hair and for a bouncy blow dry after, but I had a lot of fun in the salon fuelled with Champagne, snacks and good chat from the hair stylist, Katie, who you can see in the second picture below. Edward James is a real innovator in the hair industry as he developed the much applauded British Blow Dry earlier this year – a natural take on the smoothing Brazilian blowdry. Also, the celebs absolutely adore him. Cara Delevingne is one of his clients and she’s notoriously hard to please. However, the good thing about Edward and his team is that all ladies are made to feel like a superstar when they’re in the salon and everyone leaves with swishy, shiny model hair. Including me! For more details visit the Edward James London website. PS You can combine your hair appointment with a massage or beauty treatment in the Moroccan inspired downstairs salon. I tried a mini massage before my treatment and the combination of the natural oils and firm touch was heavenly.